Almost St. Patrick’s Day, and our plants are not dressed properly. They will have to be pinched for not wearing green! Until a week and a half ago, everything was cloaked in white. Snow is still piled here and there. The long Winter still has its icy hold on us. I comfort myself with the evergreen plants, green all winter. Slough Sedge (Carex obnupta), Pacific Coast Hybrid Iris (Iris sp) and Deer Fern (Blechnum spicant) are lovely, though slightly flattened from snow load. Some plants, sheltered by trees or the greenhouse, have kept their green going: Small-flowered Alumroot (Heuchera micrantha), Fringecup (Tellima grandiflora), Red Huckleberry (Vaccinium parvifolium). Most of Red Huckleberry’s leaves have turned a deep maroon, but some near the base of the plants are still bright green. And though it will be a while before it buds out, the Red-Twig Dogwood’s (Cornus sericea) winter color is gorgeous. I have to look close to see the optimistic little green buds along the branches of deciduous shrubs such as Black Twinberry (Lonicera involucrata). 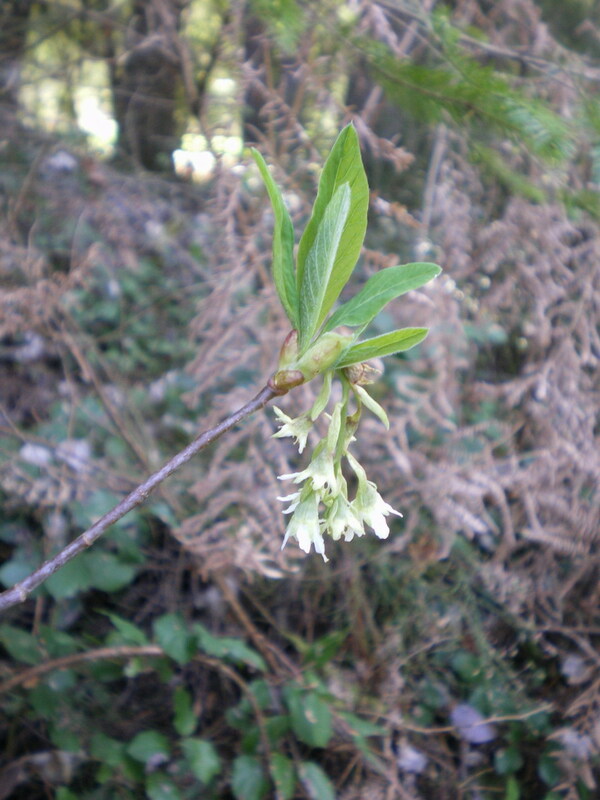 The Indian Plum (Oemleria cerasiformis) has been waiting in a state of suspended animation, its flower buds in mid-uncurl since the end of January; soon I will be able to tell which plants are males and which are berry-bearing females. Bulbs affirm Earth’s faith in Spring: Crown Brodiaea (Brodiaea coronaria), Great Camas (Cammassia leichtlinii) and Common Camas (Cammassia quamash) are trusting the future to bring longer days; they were trying to poke through the snow a few weeks ago, testing the temperature. A few White Fawn Lilies (Erythronium oregonum) in the greenhouse are showing off their pretty, mottled leaves, but it is too early to say if they are going to flower this year. Broad-leaved Shootingstar (Dodecatheon hendersonii) tentatively spreads its rosettes of round leaves, carefully hugging the ground. The forecast (sun and 60 degrees) and the plants tell me Green Spring is almost here. But we got more snow yesterday morning! We have been so immersed in White Winter that it feels like an unending, recurring dream. How will I ever get my green on? Help! Somebody pinch me! Salmonberry (Rubus spectabilis) flowers were trying to bloom more than two weeks ago – January was ridiculously warm – and NOW, on Valentine’s Day, we are (literally) digging out after the Snowpocalypse. The Bleeding Heart (Dicentra formosa) is patiently waiting for hints of spring – it may be a while! Meanwhile, I hereby declare it the Tadpole Haven Valentine’s Day Poster Plant! There are several garden perennials with heart-shaped flowers commonly called Bleeding Heart. The blossoms generally range from red to pink. Our native Bleeding Heart (Dicentra formosa) flowers are light to dark pink, sometimes white. The ferny-textured foliage can have a slightly bluish tinge, They seed themselves fairly easily and spread via rhizomes to form an attractive deciduous groundcover 1-2 feet tall. They thrive in bright, moist to fairly dry shade. In very dry conditions, in the hottest part of summer, they tend to go dormant and die back, but revive in September before going into winter dormancy. That epithet (usually “bleeding heart liberal”) became commonly used in the 1960s to imply unrealistic, excessive—perhaps even hypocritical—sympathy (but many accused of being in that category happily accept the insult as an honorable title—so there!). One area in which liberals are accused of unrealistic emotional overreaching is caring for the environment. Those accusations tend to be rooted in fear that gains for environmental protection or restoration will add up to losses for humans. But cooperation and mutuality are the answer; humans are not separate from nature. Wild woodlands and cultivated yards also make good settings for fostering mutuality between humans with differing needs and concerns. Getting out in nature is therapeutic for fostering good relationships. Work in the garden, go for a hike. Together. The bitter election season is behind us and the Holiday Season is before us. Thanksgiving is a national day to “count your blessings”, a phrase that conjures in my mind an old-fashioned Grandma telling her grandchildren to stop complaining. But as I look around the nursery, there is so much that needs to be done! It’s hard work. It doesn’t pay that great. It’s rainy and cold outside. And it feels like no matter how many native plants I grow, whole ecosystems are being destroyed faster than I can shake a live stake at! So I take another look at the nursery. I get to participate in this lovely little business, which gets me outside, gives me plenty of exercise and supports environmental healing. I can be thankful for the plants that I don’t see in front of me, that now are part of that healing. They have become (however briefly) Money-in-the-Bank, preparing to become part of the local economy. I’m thankful for my customers and suppliers, the other growers that do this good work and for the growing public appreciation of native plants and natural areas. Can I expand my gratitude beyond my own personal world? Can I expand my gratitude to include not only the obvious blessings I enjoy as an inhabitant of the USA but also the national-character-building challenges we face? Why not? So Happy Thanksgiving from this Douglas Fir-hugging, Huckleberry-munching Libtard Eco-freak Grandma to all the inhabitants of these amazing united states of America! Let’s make America grateful again! Of course, some native plants are greedy for territory while some are fairly sedentary, content with their assigned space in the garden. Every plant in any native ecosystem has a niche to occupy that benefits the rest of the system. As gardeners, we do our best to provide a space for each plant that replicates, to some degree, the natural conditions each species has evolved to prefer. Some plants have evolved to spread quickly, covering ground that has been disturbed by natural forces (fire, windstorm) or human forces (bulldozer, plow). Quick-spreading thicket-forming shrubs such as Nootka Rose (Rosa nutkana) and Salmonberry (Rubus spectabilis) prevent erosion and ready the land for trees such as Red Alder (Alnus rubra) and Black Cottonwood (Populus trichocarpa). Where winter storms have scoured the beaches, Coastal Strawberry (Fragaria chiloensis) recovers quickly, sending out rapidly-growing runners several inches at a pop, while the more mature plants anchor their roots deep in the sand. The rapid spread and evergreen leaves give cover to vulnerable dunes and limit erosion. Meanwhile, in the mature forest where the shade is too dark for many species, Redwood Sorrel (Oxalis oregana) happily thrives, its brittle white-and-pink rhizomes rampantly occupying territory until finding equilibrium with fellow native groundcovers. Even in dry areas of the forest, Redwood Sorrel has it made in the shade. The foliage efficiently photosynthesizes limited sunlight. The more moisture it has available, the happier it is, spreading its lush clover-like leaves flat to gather in as much light as possible, folding them down to protect them from rain damage. These native plants act honestly according to their nature. They are not invaders in their own home territory; they are just doing their job, thriving in their natural niche. If someone plants them, expecting them to remain within artificial boundaries when it is obvious to the plant in question that more territory with favorable conditions is available, the personalities of the human gardener and the active native plant may clash. Understanding is called for on the part of the human (we are supposed to be the smart ones J). I prefer acknowledging the energy of these particular natives by describing them as vigorous, robust, rampant or perhaps even aggressive. Please don’t call them invasive – they are at home! I officially started Tadpole Haven Native Plants exactly 20 years ago, in June 1998, (after having spent too much money to call it “dabbling”). Starting a business on our family’s property was a concept that my sister and sister-in-law and I had been kicking around for a while. We kept coming back to the idea of growing something. My brother got wind of our discussions. He is in the road construction business, and regularly perused the Daily Journal of Commerce to see what projects were coming up for bid. He pointed out that there were many of these projects that were calling out for native plantings. Maybe we could grow native plants? The idea struck fire with me. It appealed to my environmental sensibilities and seemed like a natural fit for the land, which is mostly in a natural state. We enthusiastically began learning more about native plants and came up with a name for the business: “Swamp Sisters.” My business-minded cousin Andy talked us down from that decision and we settled on the slightly more sedate “Tadpole Haven” which, a couple of generations before us, had been the name of a business next door to the homestead which raised bullfrogs for the Seattle restaurant market. The original Tadpole Haven went “belly-up” (so to speak) during the Great Depression in the 1930s. Frog legs anyone? My original partners contributed labor and encouragement during our initial experimentation with growing natives, but eventually moved on to other projects. I threw myself into learning about natives. I had no background in horticulture. Looking back, it may have been more efficient to have gone through one of our wonderful community college horticulture programs, because my mostly haphazard education is still costing me money and time! The biggest help in learning about natives was going through the Native Plant Steward program of the Washington Native Plant Society. I highly recommend WNPS and its programs as a way to expand your knowledge of native plants. Tadpole Haven began as a very part-time project with one person. Now it has taken over my life and threatens to do the same for my current partners, Brian and Lisa. But it’s all good! We are constantly learning, with the goal of growing high-quality plants in an environmentally-friendly way. Most of our plants are purchased wholesale for restoration of local parks and natural areas. Landscapers buy them for their residential projects, and some local retail outlets carry Tadpole Haven’s plants. And we also make our plants available to retail customers who want to help improve the health of local streams or welcome birds, butterflies and other wildlife to their yards.